All People’s Congress president Nason Msoni says the latest released ranking of the global corruption index falls is an indictment on the President Lungu lead PF administration with regards to the fight against corruption. In a statement, Msoni said the high level of corruption automatically in President Lungu’s government makes him ineligible to re-contest for the coveted office of President of the Republic of Zambia. 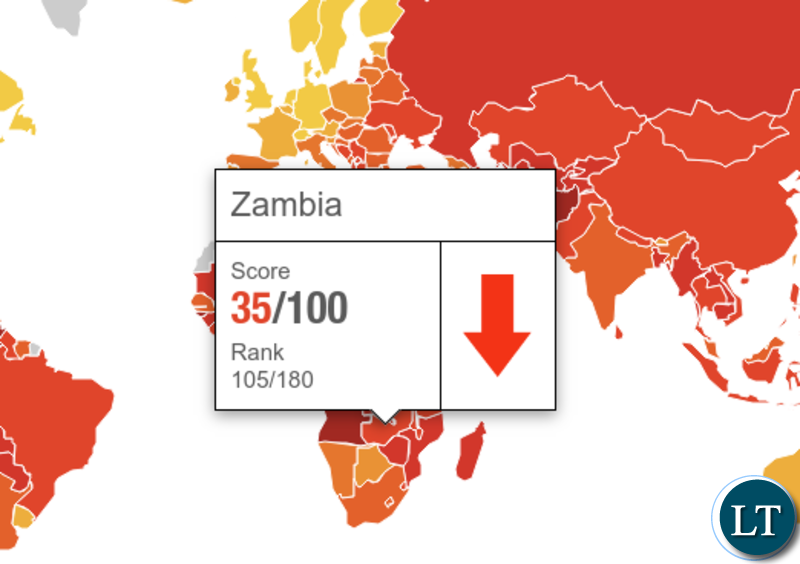 “The reported increase of Corruption in Zambia as highlighted and depicted in the latest released rankings of the global corruption index makes extremely sad reading and is a serious indictment on the Presidency. According to the 2018 Corruption Perceptions Index released by Transparency International on Tuesday, Zambia remains among the world’s most corrupt countries, with a rank of 105. Zambia had a score of 35 and was placed 18th in Sub-Saharan Africa which is ranked as the worst performing region in the world,” Msoni stated. “In view of the seriousness of the indictment it is now incumbent upon himself to come clean and demonstrate that these sustained accusations against him and his administration are baseless and unfounded. He adds that the high level of corruption vindicates former Foriegn Affairs Minister Harry Kalaba who resigned because of corruption. “In the circumstances President Lungu bares the highest responsibility as the custodian of public trust and citizens are expecting him to start addressing these embarrassing international indictments against him and his government,” said Msoni. The opposition leader was reacting the latest release of the corruption pperception index which was released yeaterday by TIZ. Idi00tic thinking…!!! You mean its Lungu who goes round instructing people to steal? You are just a frustrated, disgruntaled, jealous nashala neka opposition leader…!!!! From being a destitute living in a garage of then MMD Chawama MP Sichalwe (2009) to becoming a multi-$ Billionaire, Lungu is the alpha & Omega of corruption. Lungu lives in the pockets of Chinese who have given him a cut of almost all road contracts & other infrastructure projects. Bribe payments are made into foreign bank accounts in Dubai. He owns property in Swaziland, Joburg, Dubai. If the president had taken decisive action against the several scandals that have been exposed, no one would have excuse to blame him. But instead, he and his government have shielded and defended those who have been found wanting. The way that they reacted to the FIC report is a case in point. Another one is the 42 for 42. Mr. President, the buck stops with you. We will always remember you as the most corrupt president this country has had. It doesn’t matter how much propaganda you put out there. FTJ tried it. Rupiah tried it. But people see through the facade. Our president has no moral compass. He is an embarrassment to our country. How much money is enough Mr. Lungu? Whether you like it or not Lungu is constitutionally eligible to stand. LUNGU IS GAME. Yes, he will stand corruptly through the corrupt CONCOURT. We know he can win with the help the Corrupt Electoral Commission of Zambia. WHAT A LEGACY. Hahahaha , the PF told us in 2011 that they were allergic to corruption.Now do you see the irony ? Nason people have just become too sophisticated. Take a look at the USA . It has slipped from the to 20 less corrupt countries. There’s just too much underhanded deals going around the world. In fact according to Yahoo news Zambia is not even mentioned among the most corrupt countries in Sub Sahara Africa. That doesn’t mean there’s no corruption in Zambia. It’s there and I am sure Msoni is one of those engaged in corruption. ..eg giving money to a council employee so that he can approve your plot or plan application or paying a buyer for business. As an opposition you should tell us the way you can fight corruption when voted in the highest office and not waffling like that Mr. Msoni. That’s why we don’t have strong opposition in Zambia. All what you know is to criticize we want an opposition who who can give solution to the problems we are facing, other wise we shall continue voting for the PF since we know that even if we voted for you, you will not going to change anything. Lungu sits at the head of a corrupt administration as the “king rat” who has accumulated wealth beyond his imagination six years ago! Even his spouse has assumed the same mentality (going a jolly jaunt with a 25 man entourage to USA and not bat an eye lid!!). Unfortunately, his family has been inculcated in the vice too! Tasila is a protégé by the number of properties they have acquired over the time the father has been in office. A day of reckoning is nigh. When did Msoni become tribal? UUlya mwibala alya mwibala! What do you expect?? ?